In the hands of directors Carrie Cracknell and Lucy Guerin this is Macbeth but not as we know it. Hot on the heels of their successful collaboration on Medea for the National Theatre, the duo strip back Shakespeare's Scottish Play and rebuild it. In doing so, they remove large chunks of dialogue, replacing speech with dance and physical theatre. And the production both gains and suffers as a result. In terms of the gains there are some strongly visual moments – particularly those in which various people are despatched and the body bags pile up. But the drama also loses some of its clarity and direction. The three witches are portrayed by very solid human forms who jerk in movement as they speak. But this very physical presence loses the ethereal, mystical and menacing element of their conjuring and their messages. This is particularly the case when Macbeth returns to visit the witches for more fortune-telling. The whispered messages are so quiet they are inaudible making much of the action at the end of the drama incomprehensible to people who do not know the play. 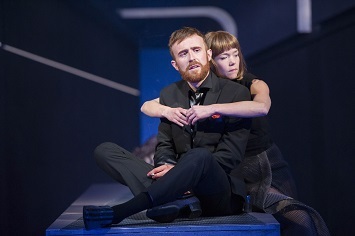 There are some strong performances from John Heffernan who plays a very human Macbeth. This is no mindless butcher but a man who vacillates between cruelty and uncertainty. Anna Maxwell Martin is a convincing Lady Macbeth who can turn her husband's doubts into action but rapidly unravels when the truth and consequences of those actions take over. Lizzie Clachan's set is stark and impressive. Its diminishing walls and tilted stage all help to create a sense of unease and tunnel the action. The contemporary setting is clearly influenced by ideas of Interrogation centres with stark lighting, bare walls and torture. There is a huge sense of unease as we watch people suffocated with plastic bags and their bodies kicked to the ground. This may be a play set in 1,000 years ago Scotland but its modern resonance is to the fore in this production. Produced by Birmingham Repertory Theatre, Young Vic and HOME, this is a brave interpretation of a classic. But in blurring the narrative, it does at times lose Macbeth. At Birmingham Rep until January 30 then at HOME in Manchester between Feb 2-6.